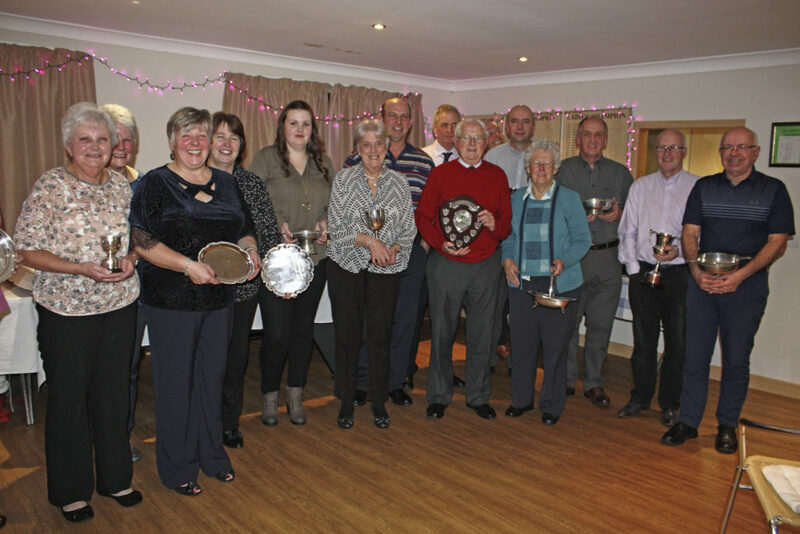 Taynuilt Golf Club held its annual prize–giving in the clubhouse recently. Winners were: Ladies 2016 Winter Eclectic – Fiona Mc–Glynn; Nant Cup – David Howie; Nant Trophy – Anne MacCalman; Gents ARC Shield – Mike Wardrop; September Swan – Anne MacCalman; Ladies ARC Shield – Anne MacCalman. Local Charity Competition – Mairead Sim; MacDougall Cup – Mark Henricksen; Childline Trophy – Moira MacVicar; Duncarden Cup – Carol MacLarty; The Putting Trophy – Anne MacCalman; Balindore Bowl – Carol Church. Action Research – Mairead Sim; Ladies Captain’s Prize – Anne MacCalman; Gents Captain’s Prize – Mark Henricksen; Laroch Quaich (Singles) – David Howie; Coronation Foursomes. Alice MacCalman and Anne MacCalman; Cancer Care – Grace Petrie and Calum Munro; Save the Children – Keith and Susan Cameron; British Heart – Jane MacIntyre and Alex Needham; MacRobert Thistle – Rob Graham and Alice Mac–Calman. August Tankard – Hugh Nicolson; Two Clubs and a Putter – Fiona McGlynn; Lochnell Quaich – Donald Cattanach; Flag Competition Anne Mac–Calman; Challenge Cup – Carol MacLarty; Inverlorn Plate – Kevin Mills; Collaig Cup – Mark Henricksen; Breast Cancer Now – Carol MacLarty; 9 Hole Competition – Eileen Hill;Kirkton Crystal; Fiona McGlynn; Catherwood Trophy – Robert MacLarty; Muckairn Trophy – Anne Mac–Calman; September Tankard – Mark Henricksen. 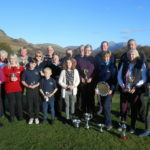 Ladies Doubles – Carol MacLarty and Fiona McGlynn; Altnacree Trophy – Anne MacCalman; Gents Doubles – Alan Hill and Robert MacLarty; Ladies Foursomes – Susan Cameron and Carol MacLarty; Gents Doubles David Laurie and Ashley Dowell; Gents Order of Merit – Andy Ronald. Ladies Order of Merit – Anne MacCalman; Bronze Medal (Aggregate Score) – Alice MacCalman; Silver Medal (Aggregate Score) – Anne MacCalman; Bronze Medal Final – Linda Wallace; Silver Medal Final – Carol MacLarty. Gents Medal Final Winner – Kevin Mills; Gents Senior Club Champion – David Howie; Ladies Club Champion – HC – Anne MacCalman; Gents Club Champion – HC – Andy Ronald; Ladies Club Champion – Anne MacCalman; Gents Club Champion – David Howie.